Mario van der Ende was the referee when Spain beat Bulgaria 6-1 in the 1998 World Cup. The loss of his national team caused so much anger with a Bulgarian man that he shot the donkey he had named Hristo Stoichkov after the star player who had led his national team to the 3rd place four years earlier. 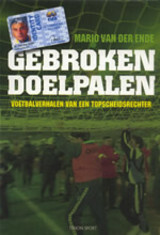 Mario van der Ende used to teach at a school while he was an international referee. He had an easygoing director and was able to travel a lot, but sometimes he just called in sick. Matches were hardly ever on tv in those days, so no one would know. However one time a colleague heard Van der Ende's name as the referee on a report on the radio and asked him next day how the match had been. That was when he realized he could not pursue both careers. Everybody makes mistakes, Van der Ende's big one was a yellow card in a Champions League qualifier Tirol vs Lok. Moscow. In fact it should have been a second yellow to Pimenov, but the Dutchman had it wrong and showed it to Maminov. UEFA ordered a replay. Whenever he is asked to tell about his career he will refer to his collumns in a magazine called Elf (eleven) or his book Gebroken doelpalen (broken goal posts). The broken goal posts the title refers to happened in the 1988 Champions League semi-final Real Madrid - Dortmund. The goal in the Santiago Barnabeu stadium had to be replaced and since there was no other goal available, one had to be fetched from another stadium. The posts broke when fans had climbed on the fence behind the goal and swayed it to and fro. The goalposts had been tied to that fence. Mario van der Ende may have his fights with the Dutch Football Association, but in Australia, August 2008, they appointed him interim National Referees Technical Director, after he was asked to conduct a review of Australian match officiating standards, systems and practices. These days (2011) he seems to be on a crusade against the Dutch FA (KNVB) and especially against referee boss Van Egmond. Van de Ende uses his blog and tweets and interviews to tell the world what's wrong with the Dutch referees (read: Kevin Blom). It's hard to take him seriously though when he blogs about himself in the third person and has many pictures of himself with second rate famous Dutch people. Van der Ende has at least one thing right when he stated that Dutch referees seem to be acting the part of referee, instead of being one.